That would be a dream! When I shipped myself off to art school it was always my ambition to get into illustration specifically for record covers and gig flyers, but became disillusioned with the advertising angle. I realise there is some fine creative work involved in the adverts, but I can't muster much enthusiasm for conceptualising package design for Jiffy Pop or something like that. I always wanted to create an iconic image that would capture the imagination in some way, something people would stare at while spinning their wax that would yield a strange power of cognitive memory just by being looked at. 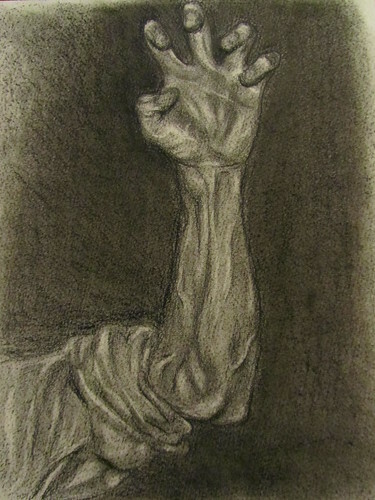 But for now, I dabble, and I really enjoy fan art and portraits of my favorite people. 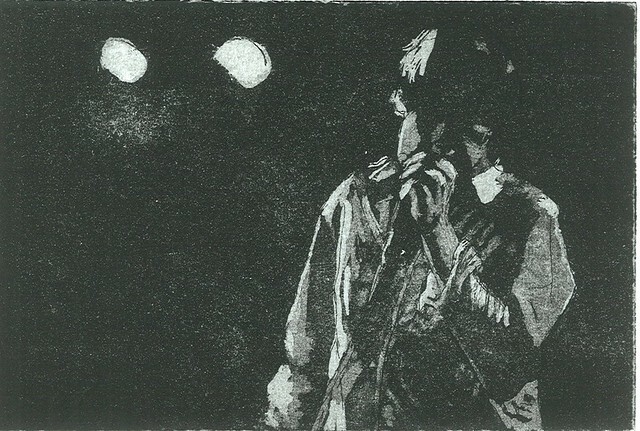 this is great, i like what you chose.. john taking in some water in exhaustion.. is this a tracing or done by eye? how long did it take you? Thanks, Hugo. This is done by eye with the Art Rage software, which helpfully allows you to pin pics to your canvas for reference just like in real life Took me a few hours over a few days. I need to work out how to export .ptg images at higher resolutions (this stuff is all new to me at the moment). Stunning, Adri. Is it a linocut? I would love a copy of your print! Thank you, Adri. I'd really appreciate that. If it looks that good now, I can't wait to see it finished! As this is the first time I've played around with this medium, I'm expecting this to be my worst collage. I tried to incorporate visuals I get when I listen to John's music. It always strikes me as sounding hauntingly sacrosanct as a ruined churchyard, with something eternal and intangibly vast in its scope. And the missiles reminded me of "Pure Rockets." This is unbelievable. Great work. The others are great too. Me again. 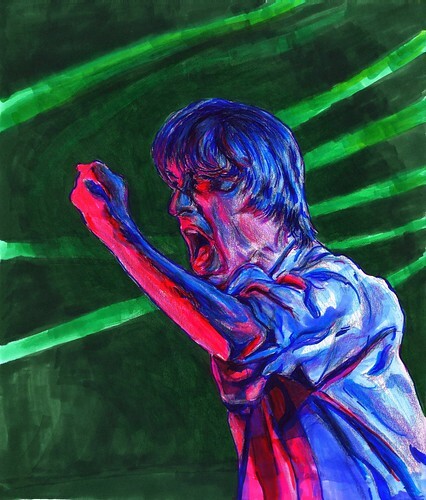 This will be part of a series hoping to capture the intensity of John Maus's live performances. I like all of these pictures, they have enthused me. Thank you. I am glad!